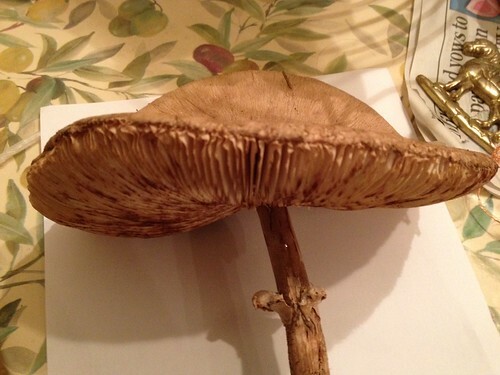 I've found a couple of mushrooms which I believe to be parasols but I'd like to know your opinions before trying them. 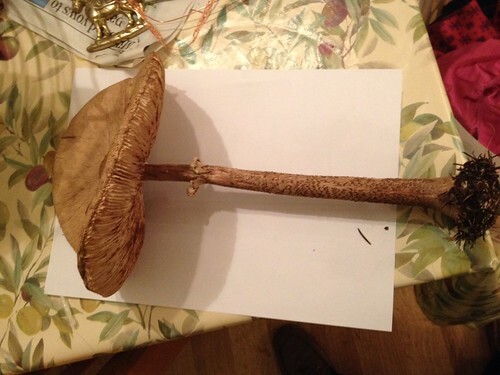 The stem is 10 inches in length, fibrous and with a scaley pattern. 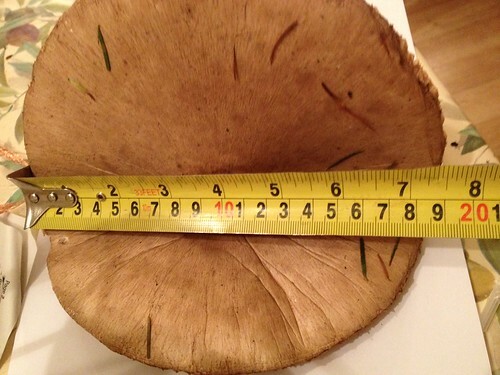 Cap is 7.5 inches across and is smooth and leathery. Found on a grassy bank on the edge of a mixed tree wood. I'm doing a spore print as we speak. My parasols have spots on the cap, which do sometimes wash off on old ones like this. Hmm, it was the lack of knobbly bits on the top with gave me pause. They do look a bit past it but if they are indeed parasols, I might fry up a bit to try as it's not a mushroom I've tried before. They don't look like parasols to me Is the ring loose? nor me but im only a beginner of 30 odd years,is it worth it to risk eating them when a proper id will either save you or remind you where to look next year .even if they edible they really do look a bit elderly which has issues such as poor taste,texture and biological challenges from decay products. Don't look like parasols to me either. The top is too smooth - most parasols have 'scaly' tops. the snake like striations on the stem, and the size does point to Macrolepiota procera [parasols] through eliminating any other poss. nasty species [in my opinion as an old hand!!!] but in the final analysis the pos. id and subsequent edibility -on forums-is always with you because of obvious reasons!!!! Even if that is a parasol (looks it to me as per bubble's analysis), it's passed it's best so you won't actually be "trying" parasol properly.